. As expected, there’s more to the story… first, check out her friends list. Here you can see the screen shot of her friends including Dorit Reiss. (Kristen conveniently no longer has her friends list made public). Who is Dorit Reiss? What Wikipedia fails to mention is that Dorit is a known internet troll. Amazingly she is found posting at all hours day or night. 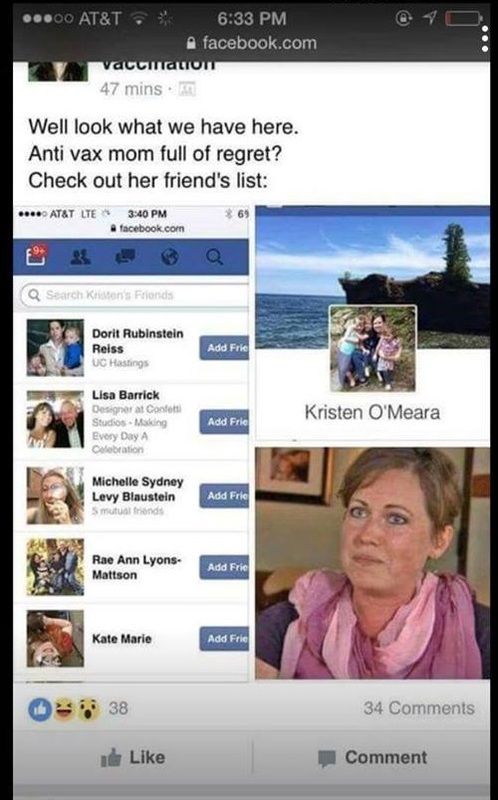 One day while simultaneously attending a legal hearing, she was online arguing with me about vaccine safety on Senator Pan’s page! Even more juicy… our lovely Rotavirus mom is married. To whom? 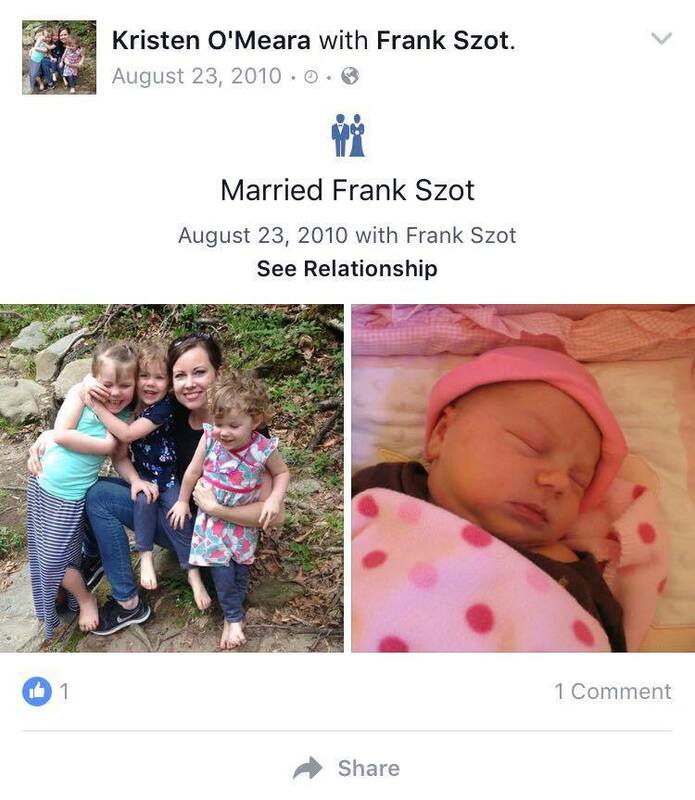 Awe, what a sweet family… now if you take a look into their profiles you will see that she is married to Frank Szot. 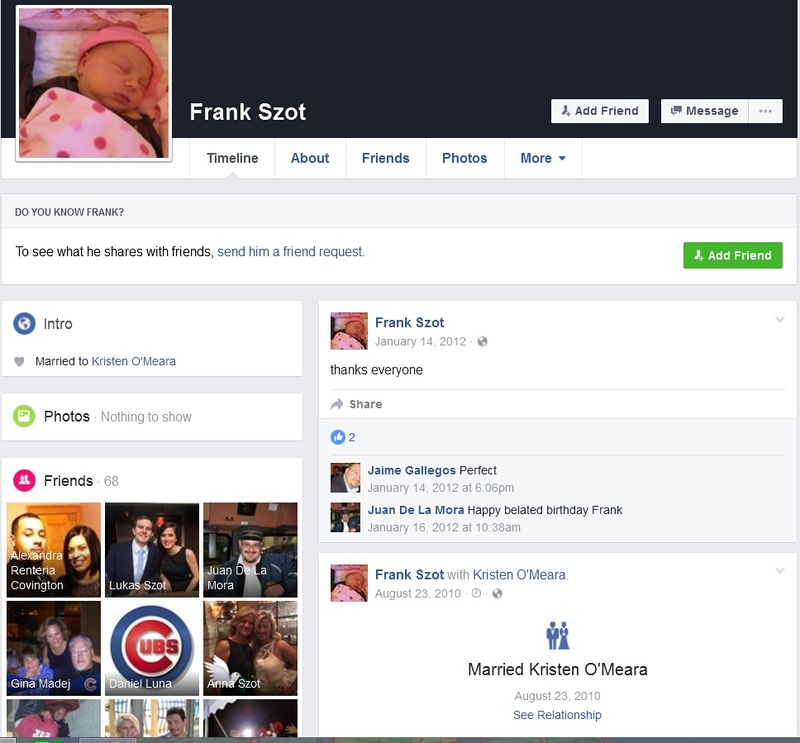 Frank Szot is facebook friends with Lukas Szot (VacTruth claims they are brothers, see below Frank Szot has the same baby photo as Kristen, and under his friends is Lukas)…. And what does Lukas do for work? He works for Abbott Pharmaceuticals. 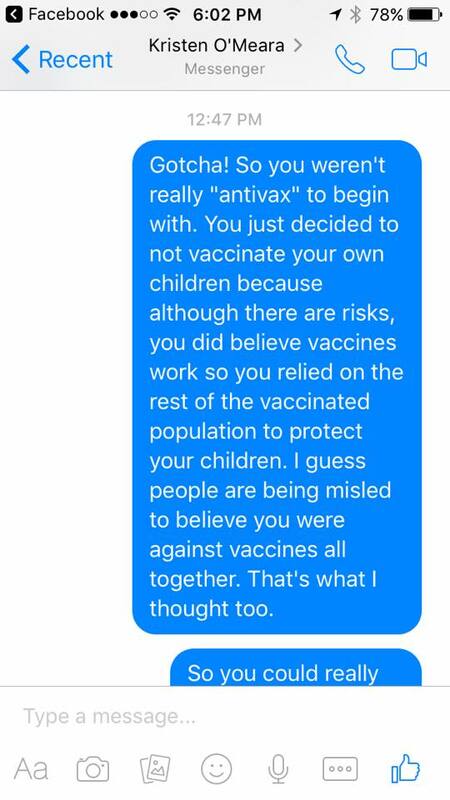 UPDATES: So I am hearing that people have been contacting Rotavirus Mom themselves, and a trusted friend sent me this conversation, where she denies ALL ties to pharmaceutical companies. I will include this as she wishes to deny the link. But I find this quite the claim, considering the evidence is above. Had she said something along the lines of “it doesn’t matter that my so-and-so works for Abbott…” then maybe it would be a little more believable… maybe. 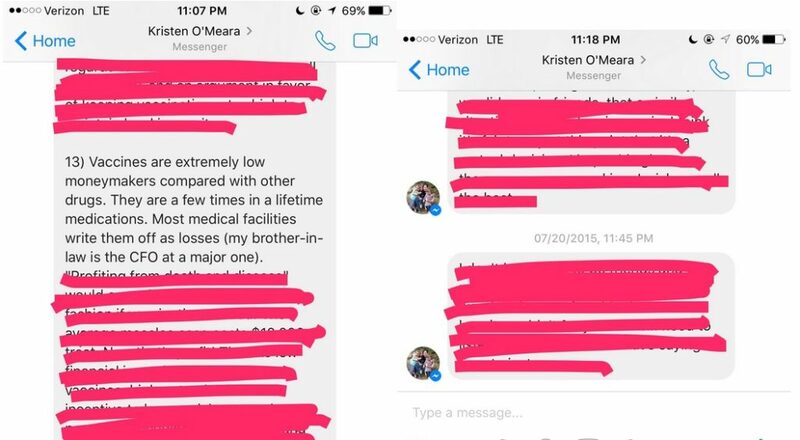 The anonymous friend did admit that Kristen was not vaccinating because for multiple generations her family hasn’t vaccinated, but that she did little to no research herself. The friend told me that her husband was pro-vaccine and pressuring her to vaccinate their children. When her kids, her husband, and her all came down with a stomach bug, that’s when the situation changed. What’s interesting about this scenario, is that Rotavirus is not a vaccine that can be given to anyone over the age of a year. The idea for this blog came from some circulating information on Facebook, including VacTruth’s info meme below. I’m unsure who to give credit to. I was able to confirm the information myself before writing this article, the only piece I did not confirm myself was how Lukas Szot and Frank Szot are related. Thank you for the information – great post! People say anything to cover up their lies! Lies after lies – yet nothing will stay hidden! 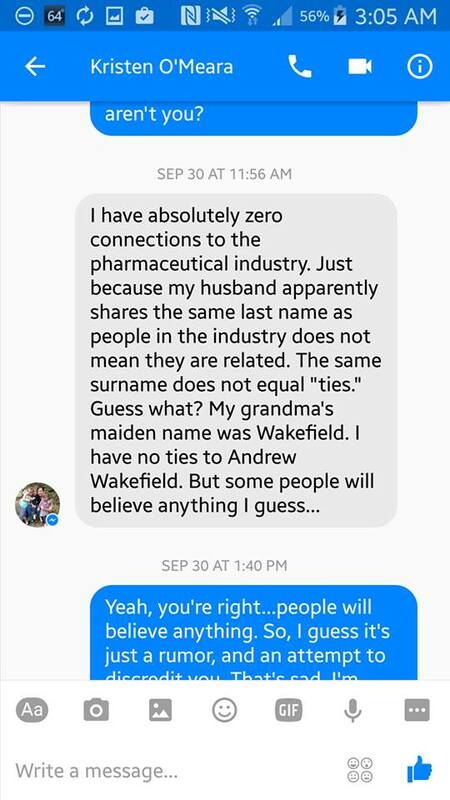 I have an email conversation with her saved from a year and a half ago where she told me her brother in law works for pharma. Contact me privately and I can share. I sent you an email over a week ago. Please reply to me there. This (below) is not my real email address. Hello anonymous, thank you for sharing. Unfortunately I realized the contact form was not working properly. It should work properly now if you want to try and reach me through this form! I used the link. Let me know if it didn’t work! Anonymous, I sent you an email a couple days ago. Please let me know if you didn’t get it. Still nothing from you… ? I did email you at that address and I shared the screenshots. I got it working and sent you a message back! Sorry for the delay. Still nothing from you… I’m gonna throw in the towel at this point ? You have the screenshots and are free to use them. Hello anonymous, I sent you two emailss but have gotten only one message from you, with no attachments. I’m sorry this isn’t working well… can you try emailing me directly at theviennareport@hotmail.com? I will be more than happy to clear this up, since y’all are so incredibly interested. 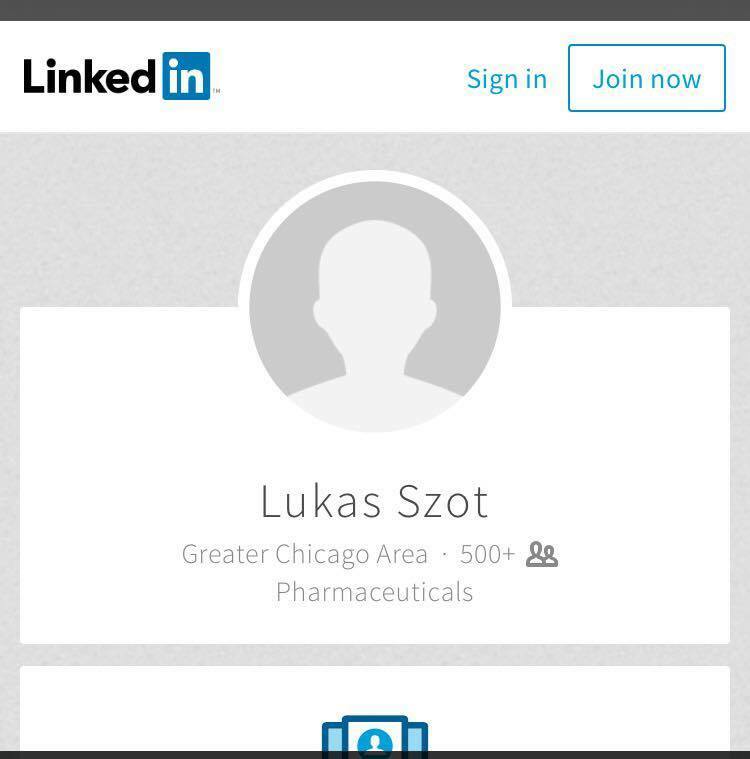 The brother in law that I referenced in the private message that a former friend has shared is not Lukas Szot. 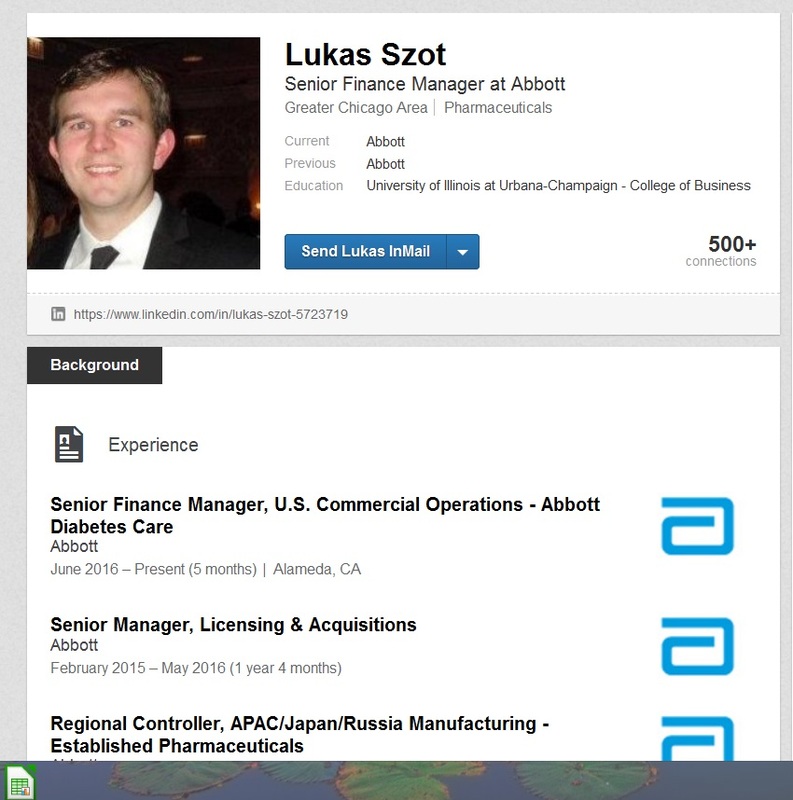 Lukas Szot is a member of my husband’s extended family and lives in California. I did not know who he worked for until this insane conspiracy nonsense appeared. Thanks to y’all, now I know he works for Abbott! Great detective work, guys. My sister-in-law is married to a financial guy at a health facility – that’s the brother-in-law I referenced in the PRIVATE message to a friend – and out of curiosity I asked him about the topic. Out of respect for the privacy of my friends and family, I had to tighten things up on my FB account, because all manner of intrusive and menacing things were going on. Every word of my story is true, as I wrote it in Voices for Vaccines. Sometimes the simplest and most straightforward explanation is the true one: mom didn’t vaccinate, kids got sick, mom changed her mind and decided to vaccinate. The end. No one has paid me anything to tell the story. I responded to a call for submissions from that organization and decided I’d share my story, having no idea it would go viral. It’d be so much simpler if you went public with your kids’, and your vaccine updates. And use an MD that the public provides, not someone you or yours can pay off discreetly to tamper and destroy any evidence. We are here to fight for our children, their lives, to protect them from any and all harm. We’re here to share how our children, born healthy, suddenly developed health problems, some that tragically led to their demise, shortly after having vaccines administered to their once-pristine bodies. We’re here because we’ve suffered, our children suffer, in the name of ‘medicine’. We’re here because we want to make sure that all parents are well informed beyond mainstream manipulations to avoid the tragedies we’ve endured. So, please, do not belittle or patronize us. Our moral stance trumps ego, vanities, titles, degrees, or bank accounts. Get a lawyer to provide undisputed evidence for the public to review that supports your statements – vax schedule, clean bill of health, etc. End of story. Until then, your word means nothing to us but self-serving propaganda from those who have injured, and murdered our children for profit and power. You know, I actually thought about posting my daughters’ records, but that would not do any good, the same way the birth certificate did no good for Obama vs the birthers. People believe what they want to believe. In the end, this story will get buried by the next big thing (actually, it already has) and nobody will care anymore about the Rotavirus Mom. And for that I am grateful. Two more things: Of course I researched my position, both anti and pro, and Anonymous knows this. She’s the one who asked to borrow my anti-vaccine books when she was deciding whether or not to vaccinate her children. And no, “generations” in my family have not been anti-vaccine. Several members have expressed concerns about the schedule and spacing. My siblings and I are all vaccinated as are our parents. Owning books does not equal “doing research”. It just means you owned some books. You have shown your hand by sharing my real name in your public post. To me sharing and commenting on a PUBLISHED STORY pales in comparison. You put yourself out there for scrutiny by writing your story. I called myself Anonymous on this post not because I’m a coward but because I’m scared of people like you. I would edit this to reflect that fact, as maybe miscommunication occurred between your friend and myself, but your story keeps changing! I know of several people who contacted you directly and there are so many inconsistencies, so I’ll simply leave your comments to reflect your statement. I don’t blame your friend, I’ve met some super crazy pro-vaxxers (some just passionate and others who were paid) who are willing to call CPS on parents, report people to their jobs, and threaten them. I’ve been in this long enough to know it happens. Hopefully Kristen, you have not experienced that that kind of retaliation. Well, for one thing, I realized (too late) that people were presenting themselves falsely as pro-vaccine in order to dig around for information. So in my naïveté I went ahead and responded. But I do not believe I contradicted myself or presented changed versions of the story. The problem in this very specific case is that my ex-friend has increasingly isolated herself from people who truly love(d) her and want nothing but the best for her. She went on an email rampage where she threatened to harm me and called me horrible things, and has done similar things to other friends who care for her. It is very sad. Again, when you engage in these sort of conspiratorial tactics, trying to expose honest people as frauds and invading others’ privacy (my real name is in the screenshot, and was a private message), you are inviting a response from the maligned party. I am sorry you are experiencing delusions of persecution. I have no interest in you whatsoever, except to expose you as the real coward and fraud. You are the one threatening me in private. God you’re a moron. Your real name WAS IN THE ARTICLE YOU WROTE. Everyone has known your real name since YOU put it out there. How exactly am I a fraud? I never did anything except reply to something you PUBLISHED (that means people everywhere could read it). I never said anything that was untrue or made any claims about ANYTHING. I’m glad you’ve had your 15 minutes of fame, but apparently that’s not even enough for you. Get a life. Sharing private information is an invasion of privacy, as I did not wish to publicize personal interactions. Again, you chose to put yourself out there, privately here and publicly elsewhere on social media, and shared information that is not true. Perpetuating lies is fraudulent, especially when you had the means to verify whether or not it was true. Ad hominem is a logical fallacy that demonstrates a lack of intellectual vigor on your part, not mine. Never commented or shared anything publicly. Only with other intelligent, like-minded people in private groups. What lie did I perpetuate? I shared something YOU said. Were you lying? And there are no ad hominem attacks going on from my end (congrats on using such big words). Like I said, I always maintained that you were NOT lying. The only info I shared was what you told me yourself. Look, I have not contacted you nor even considered contacting you for the past year and a half. Please leave me alone. I think you’re a little unbalanced mentally (ad hominem! but not really since I’m just telling you that). I don’t plan on reading or responding to anything you have to say. This is out of hand. Like I originally said, enjoy your life. Likewise I have not contacted you during that time except last night to tell you I know about this and I think it was despicable. It could easily have ended there. I did not ask for or expect this series of increasingly agitated, insulting, and threatening responses, both here and via email. And likewise it seems to me that you have some unaddressed mental health issues yourself. In fact, you have shared as much with me. I am glad you are ready to put this to rest. When I saw this story I was disheartened because it was serving as fear based propaganda. I have a vaccine injured child and personally have met hundreds of others with vaccine injuries. 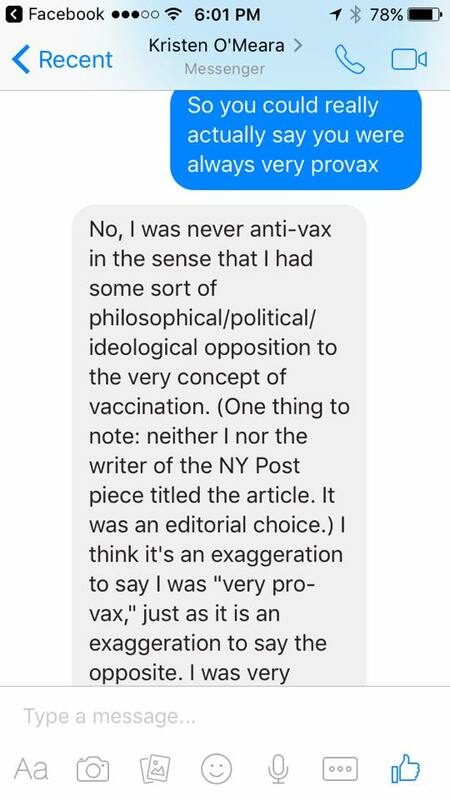 I received several messages with links to your story from friends who were in the midst of researching vaccines for themselves and their families, who were worried because someone staunchly anti-vaccine changed their mind so drastically. I am curious, did you all get up to date at once? The rotavirus vaccine isn’t approved for anyone over age one, so I’m curious if you received that as well? And if you and your kids all got caught up/are in the process, I sincerely hope that everyone is healthy and suffers no adverse reactions. This original claim by Kristen is he biggest piece of propaganda I’ve ever bothered reading…. 3 and 5 yo with roto? And you deem this as a reason to vax? Roto is not given past 6months, plus it’s live so it causes roto more than prevents it. I couldn’t read past the part where she mentions Wakefield being debunked. Total garbage. Wow – good detective work! Kristen O’Meara. Let me give you a little insite on this Rotavirus vaccine. I am a mom of three children ages 22,7 and 3 years old, I am a older mom and raised a child before this nasty vaccine was ever made. My oldest daughter got Rotavirus she survived, it never made her really sick. Fast forward to my second child, he received all 3 of the CDC recommend Rotavirus vaccines and you know what? He GOT the Rotavirus after his 3 rd vaccine. He had the same symptoms and severity as my older daughter. This vaccine made no difference between both children but My younger child suffered vaccine reactions from this vaccine. As I’m sure you know Paul Offit made mega money off this vaccine and pushing forward on the CDC schedule but I am sure you know this being a paid troll. First of all, I have the deepest sympathy for families who are dealing with health problems they attribute to vaccinations. I am not in the business of invalidating those experiences or claims. All I did was tell my story without judgment for others. Babies are given the rotavirus vaccine because it is at this age when rotavirus is most dangerous. It causes dehydration and babies cannot rehydrate as easily as older children. It is a huge killer of babies worldwide. Rotavirus can be contracted more than once over the course of a lifetime, as there are different strains, and immunity to the disease is not lifelong. This is why the adults in close contact with my kids also got it. When your kids are literally leaking diarrhea pretty much constantly, it’s hard to maintain a sterile environment. Yes, my kids are all up to date. I brought my oldest daughter in first and was planning to be very conservative with catching up. But when she suffered no adverse reactions whatsoever, I gained confidence and began following the CDC recommended catch up schedule. My girls are the same healthy, happy kids as ever, and have not experienced any adverse effects whatsoever. Most people are not paid to do media interviews. I have not been paid a dime for any of this, and it has eaten up considerable amounts of my personal time as a full time teacher and mom. I continue to speak with people because it is an important issue and there are many misconceptions and much misinformation out there regarding vaccine safety. In the end, we all want the truth. We all want the very best for our kids. I believe this is a conversation worth having. I hope eventually both “sides” can learn to be more open to honest discussion and, at the very least, agree to disagree while still honoring the good intentions of parents on both sides of the fence. Also: my girls contracting rotavirus is not the sole reason I changed my mind. There were many factors. But it really doesn’t matter what they got. It could have been pertussis. It could have been tetanus or, God forbid, meningitis or any number of things. The wake up call for me was the fact that they caught an illness that might have been prevented. We live in a germy world. Kids catch colds, other stomach viruses, respiratory viruses and all manner of unpleasantness. Their immune systems are working constantly to keep them healthy. I realized that if I could spare them from some particularly nasty illnesses, I personally would feel a sense of guilt if I continued to choose not to. 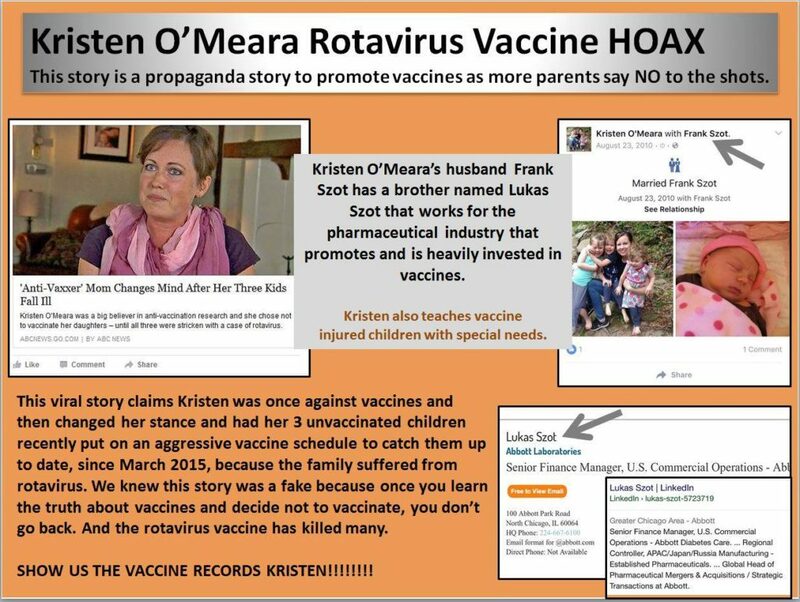 Kristen, by putting your name out there you allowed yourself to become the new poster girl for the “anti-vaccine movement,” portraying you – and we – as uneducated idiots who were following the crowd or too busy praying to the tree gods to notice science passing us by. Sounds a lot like the anti-suffrage campaigns. Women are too weak and emotional to handle such societal decisions like voting or vaccinating that those decisions must be left in the hands of the ones in charge. It’s sad they would turn you – or anyone- into that. Unfortunately, the pro-vaccine world hates you for not doing you research. And the anti-vaccine world hates you for not doing your research. A friend of mine was treated the same, she was an educated woman who selectively vaccinated and spent a year getting some vaccine choice legislation passed. 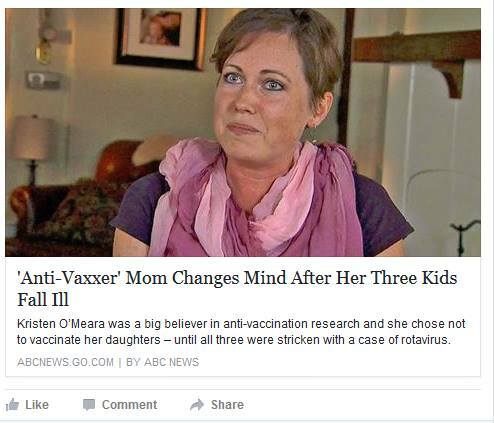 But still, the news picked and twisted this strong woman’s words to make it sound like a wishy-washy, emotionally-driven mom who chose not to vaccinate based on feeble intuition and distrust. I wrote this article to prove that you are not the poster girl for us. My infant daughter had measles. Did we change our mind? No, measles is a mild illness (she got it from a vaccinated kid anyway). My niece had whooping cough, did my sister and I waver? No. Because 4 fully vaccinated family members got it too. As a family with members who were damaged, hospitalized, or died from vaccines, getting childhood illnesses like measles, rotavirus and whooping cough pale against such comparisons. Especially since some of our family members grew up before vaccines, and others only had 2 vaccines during childhood in England. They remember that these illnesses are usually mild childhood illnesses. Thank goodness your children got over the stomach bug. But I find your story about getting the adults around you vaccinated for Rotavirus fishy, since it is not licensed, approved, or tested safe for anyone over one year of one. Are there really doctors willing to give vaccines to individuals with no known studies to support its safety? I hope not! But I’d take rotavirus or measles any day vaccine over the struggles my vaccine injured daughter endures because she may never recover 100%. Nor will Lea’s. Or the nearly 5000 other names written on the Vaxxed bus. Unfortunately, the misconceptions you speak of are within the pro-vaccine community and pro-vaccine marketing materials. The exaggerated efficacy and the under-reporting of vaccine injuries are the two biggest misconceptions about vaccines in existence. Informed consent is just not happening. Dont you already know that when you have children they are at risk for every posssible situation in life. Even if they are vaccinated, they are still at risk. It sounds like you were not informed on anything (risks, benifites, or viruses work, how you can contact rotovirus ) before you had children. It doesn’t give you very good credabitly on the subject. After raising children for so long then all of a sudden you realize they can get sick? I completely respect your point of view and appreciate the calm and even tone with which you expressed it. If only there were more of that in the world. I will not deny that I’ve had reservations all throughout this experience. When I shared my story on VFV, I truly believed it would be no more than a blip on the radar. I was not trying to be a spokesperson for anyone but myself and my own experience. I am a classic introvert who feels way more comfortable at a keyboard than in front of a camera. I also will honestly say I was disappointed with how the Post article turned out. I didn’t like the sensational title (editorial choice, not the journalist’s) or the dramatic tone. If you read the VFV essay I wrote, you might feel differently about the story. My friends and family (some of whom remain suspicious about vaccination) overwhelmingly prefer the story in my own words. However, I have since spoken in other venues and have been given more of an opportunity to express my own thoughts. I know I’ve gotten it from both sides, but on balance, I’ve received way more positive feedback than negative. I have had some great conversations with good hearted people on both sides, with the above glaring exception. I think there is a potential to open up the dialogue and reach some mutual understanding on this issue. I truly feel for and can relate to both sides of the issue, having been there. I did not receive the rotavirus vaccine and never said anywhere that I did. My girls did not either, as they aged out by the time they were vaccinated. I mentioned in a previous comment here that my siblings and I are vaccinated, meaning we received our routine vaccinations as children. I still remember taking the polio sugar cube. If there is a claim anywhere that I received the rotavirus vaccine, it was not made by me. I see I read this and assumed you were speaking to the vaccine, not the illness… that was my mistake. I also wish the information out there were more even, finding middle ground and understanding between the two side the media and pharmaceutical marketing has created in our society.